120 year old traditional sandstone holiday cottage, near Edinburgh, Scotland. Conservatory, woodland, garden with covered fire pit area. Sleeps 4 (2 adults + 2 preteen children) in 2 bedrooms . Very well equipped , self catering holiday home. Comfortable, relaxing, clean, inviting & welcoming accommodation. Cot, high chair, baby equipment on request. Indoor games. Log burning stove. 1 bathroom with shower over bath. View of 3 Forth Bridges and fields. Parking. Lovely enclosed back garden, with B.B.Q, croquet, bistro table and 4 chairs plus 2 steamer loungers. wander freely at your own risk, please take care and accompany children ( small stream, etc.). Some ancient woodland and meadow with many rustic walks. Nesting birds, including peregrine falcon, pheasant, buzzard. Roe deer, badger, hares, butterflies, flora. Bluebells in May, wild orchids June to August, thousands of ferns & Meadowsweet. Acres of space for your children to learn about nature.Ideal also as a winter holiday getting to know Edinburgh. Individual, not buy to let. Indoor entertainment. 24 hour call for maintenance. Owners keen to make your holiday enjoyable. Lots of local information supplied, including links to local supermarket & attractions, on your email booking information. 2 miles to Farm with real bread, cakes, scones, free range hens. It's lovely, do come to stay. A welcome home from home, with extra touches. Distinctive features: We have a keen interest in repairing & decorating & are constantly making improvements & restoration ( i.e. original wooden doors & some floorboards, etc.) indoor feature shelves, facings, garden furniture from local dead trees. Newly decorated interior March 2017. Super Calthermic heating installed November 2018. Edinburgh is only 20 minutes (10 miles) and is easy by car, bus or train. The ancient Burgh of Inverkeithing is one mile away, with good train & bus links, Park & Ride, bank, small shops, post office, library, take away food, phone box. We (Chris and Yvonne Barley) are in a small cluster of cottages at Duloch, like an old hamlet. Dunfermline, Stirling, Edinburgh, Glasgow, Perth, St. Andrews, Pitlochry, Trossachs National Park, Loch Ness, fishing villages, etc. are nearby. Local golf, falconry, riding, walking, cycling, castles, coastal areas, shopping, eating, distilleries. Skiing at Glenshee, etc. Cycle track a few metres from the cottage. A great area with plenty to do for all ages. Childrens' park, beautiful blue flag beaches, sea and boat rides nearby. Plenty golf courses, some with spectacular coastal views. Great touring, historical buildings. Lovely coastal & fishing villages. Edinburgh festivals -science, film, book, music, tattoo, fringe. Royal Highland show, Knockhill motor racing circuit. Homecoming Scotland, September open door historic buildings. It's a good place for holidays, most hobbies, personal development & learning experiences. Great cities, countryside, heritage, history, parks, botanical gardens, shopping, golf, falconry & leisure centres, riding stables, Falkirk wheel (canal boat). Book for 2 weeks or more, there's so much to do. Monday, Tuesday or Wednesday arrivals are given preference but other arrival days would be considered. We are a married couple and have lived here since 1972. We are keen for you to have a good holiday and will go out of our way to help. We enjoy improving and maintaining our 2 cottages and woodland. Look us up on the internet for more local area information our blog woodlandcottages.co.uk Our phone is 07957 264 805 We have 45 years of local knowledge for you to benefit from. They are unique, 100+ year old sandstone farm cottages, comfortable and characterful. A perfect holiday base, close to Edinburgh and many other historic cities, 1 mile from the nearest town of Inverkeithing. Family friendly. Lots of thoughtful touches..
15 acres of woodland. Garden room with log burning stove. Garden with covered fire pit area. We know the area well and leave lots of helpful local information. We are on 24 hour call if help or advice is called for. We love our cottages and woodland and enjoy having happy holidaymakers. Not run of the mill, not buy to let. Some original features, some hand built features such as solid wood kitchen surfaces. View of 3 historic Forth bridges. Cosy calthermic heating, installed November 2018. Hand crafted features made from re-cycled wood. Shower over bath. Some toiletries. Soap, shower gel, 2 rolls of toilet tissue, etc. Overlooking a field and B981 at the end of the front garden. Leads to woodland from the back garden. Ultra efficient, modern Calthermic radiators. To help us set them for your comfort, give us a rough idea of your holiday plans. I.e. In all day, out all day, out in the afternoon, etc. Cafetierre (french press) Plus simple filter machine. Herbs, salt and pepper. Oil and vinegar. A few tea bags, sugar, etc. Kitchen roll, dishwash powder,, foil, etc. Welcome basket with local produce such as real bread and free range eggs. small victorian breakfast table in living room. large table in conservatory. Leading to woodland. Fire pit in covered area with BBQ. Big living room (7 x 5 metres), medium size bedroom & kitchen (very well equipped), small bathroom & bedroom. Sorry No pets or smoking (there's an outdoor smoking area with table, seating, ashtray & parasol.) The 2 bedrooms make it ideal for a small family Suitable for some elderly ( ground level) and children (handmade child's Windsor chair, books, games, toys, play in the woodland.) To save you carrying, I can supply, (request in advance, baby/toddler items :- baby bath, bath mat, changing mat, microwave bottle sterilizer, bouncy cradle, sink step, mugs & bottles,, a travel cot & bedding, high chair, etc.) Lots of toys, family games, T.V ., DVD player & good DVD collection, free view digital channels. Bookcase with hundreds of interesting books. The usual brochures, you can request more extensive guides such as fishing, golf, special interests or needs etc. Plenty nearby indoor activities for rainy days. The Cottage was a great place to spend few days. The woodland was an interesting place to wander through and Chris's camping buildings were all intriguing. Inverkeithing station was a short walk which gave easy car free access to Edinburgh and Cramond island is a must if the tide times are favourable. Glad your family enjoyed some of the nearby places to visit. The walk/cycle path is handy to get to the railway station. We were now already for the third time in the cottage and we love it. The house is very tastefully decorated and cozy. A rainy day is not a problem here, because all the rooms are very cozy. Even our teenaged children always come back with love. It's great fun to cook in the perfectly equipped kitchen. And the new extension is fantastic. The location of the house is well suited to explore the surrounding area, such as Edinburgh, Lothian and Fife.Next year at the same time we will be back. Many, many thanks to Dorothy and Chris. They do everything to make their guests feel at home. Glad the cottage is ideal for a family holidaying near Edinburgh. Chris and Yvonne. We stayed in the no 2 Dales cottage, it is next door. No 2 is fantastic, nice and very comfortable. The cottage has a spectacular conservatory with way out to a beautiful garden. The kitchen has a lot of electrical appliances and kitchen utensils. There are many brochures and maps of Scotland. They helped us very much in order to travel and sightseeing. There are many toys, crayons and some films for children. We had a wonderful week in Scotland. We sure that we are going to go back. Thank very much Yvonne and Chris. Many thanks to an appreciative family. My wife and I stayed at this wonderful cottage for our vacation. We enjoyed the quiet and solitude of a country home with a great view of the Forth Bridge. Yvonne was very helpful and understanding when our plane was delayed and our arrival was way past our expected time. We enjoyed the welcome package and the kitchen was well equipped and the living room was very cosy, we felt at home there. We would certainly want to look into staying there when we return to Scotland. We stayed in the 'upgrade cottage', no 2 Dales cottages. Yvonne and Chris were very helpful and we appreciated the welcome and the lovely tray of goodies - the bread from the local farm bakery was especially delicious! The cottage is very well equipped and extremely interesting in the way that it has been renovated. 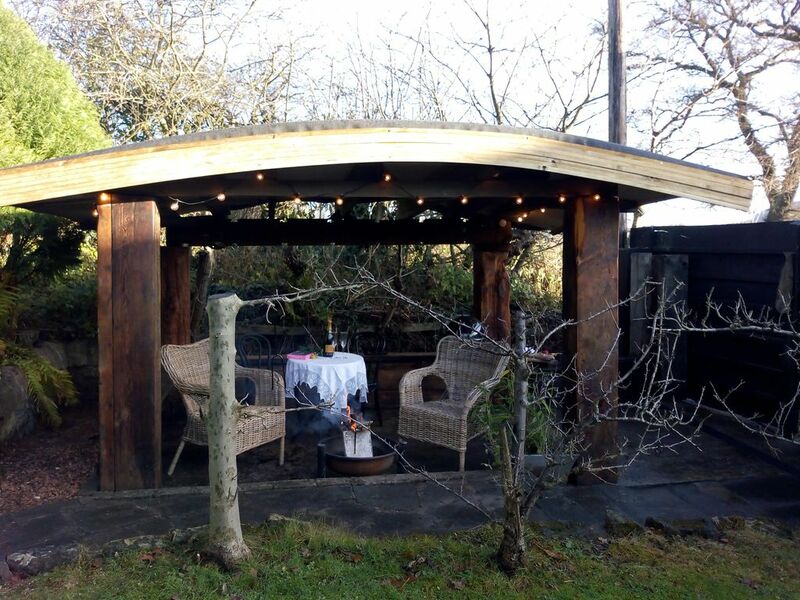 Chris is a skilled woodworker and has used reclaimed wood throughout, which is commendable. Chris and Yvonne have worked so hard to maintain and improve the cottages and their woodland campsite in a sustainable way. They obviously love their piece of land! The only thing that we would change is to have more comfortable mattress on the single bed in the small bedroom. The location is really fantastic for exploring Fife, Edinburgh and beyond. We have had a wonderful holiday, thank you very much. A pleasure to have such appreciative guests. Don't forget to tell us straight away if there's anything you need, we can fix it immediately. Don't wait until you get home. We want to make your stay as enjoyable as possible. This neat cottage with it's lovely and absolutly complete interior and equipment made our holiday in Scotland a highlight in years. From the very warm welcome till our leaving with a tear in the eye we had the most wonderful time. The living room is so cosy and perfect to relax after a long day out, the kitchen had every gadget and dish and pot we needed (and even more). The bedrooms with the quality beds were so nice as the bathroom was. This place is great even without a car. Trains and buses from Inverkeithing (less than a mile to walk) go everywhere. So we had the chance to see not only Edinburgh and Dunfermline but also some terrific parts of the Fife Coastal Path - which we would recommend every visitor. Thanks Yvonne and Chris and we'll be back somewhen! Ideal for 2 adults. but can also sleep 1 or 2 children. shops, bank, take-away food, etc. 3 miles to Dunfermline (Robert the Bruce & Andrew Carnegie), Fife, Scotland, United Kingdom. Scottish villages, towns, castles & historical buildings. St. Andrews, (golf), Stirling (William Wallace), Glasgow (Charles Rennie Mackintosh), Culross, South Queensferry - ( R.L. Stevenson) . Lochs, Glens, National parks, whisky distilleries. Rick Stein recommends fish shop). 5 blue flag beaches incl. Aberdour, Burntisland. Children's attractions, swimming pools & flumes, Deep Sea World. Lochore activity park. 2 miles to Fife Leisure Park with restaurants, pubs, 10 screen cinema, crazy golf. Knockhill racing circuit. Boness steam railway. The Falkirk Wheel and the Kelpies. Great for walkers & cyclists, nearby link to Fife Coastal Path. Other Activities: Flying club, walking, cycling, seaside, falconry, golf, fishing, bird watching. Food take away, Chinese, Indian & fish bar - award winning. Lots of great restaurants in Edinburgh and some good local ones like Aberdour hotel and Hawes Inn. 2 miles north on B981 is an artisan bread baker, open Friday, Saturday and Sunday, also sells free range eggs, cakes, jam, cheese, olive oil, vegetables and fruit, etc. local brew beer, hand made soaps, wine. Rates include bed linen, towels, hospitality basket, a reasonable amount of cleaning after your stay (if you leave the cottage as you find it). Wi Fi . 2 baskets of wood and a bucket of coal provided in the cottage and a reasonable amount of electricity. For higher usage of fuel, an honesty donation would be great, thanks.Usual accepted E.T.A is 4p.m. and E.T.Departure is 10a.m. Please request at time of booking if you need a different time.